Douala (Wouri) - Two wildlife traffickers were arrested in Akwa, Douala in the Littoral Region, following a sting operation carried out by the Littoral Regional Delegation of Forestry and Wildlife. They were arrested in possession of two ivory tusks and over a hundred of sculpted ivory products. They were about to sell the illegal ivory products when they were arrested. The government of Cameroon has put in place procedures and regulations to protect natural resources from leaving the country that is why according to Mrs Fosi Mary, former technical advi ser of Environment and the Protection of Nature, "Countries have a sovereign right over their biological resources and no one can collect any resource from a country without the prior consent of the country of origin, so the government of Cameroon, within the framework of the Convention on Biological Diversity and CITES and other conventions in the field of environment is trying to protect resources from leaving the countries without authorization We receive applications from people who want to move resources from the country and we provide authorizations and certificates of origin of the resources concerned which is shown at the ports of entry”. To curb this phenomenon, the Central African subregion has seen the emergence of projects involved in wildlife law enforcement with project such as the wildlife enforcement program launched in Cameroon in 2003 by the Ministry of Forestry and Wildlife in collaboration with LAGA – an international non governmental organization specialized in wildlife law enforcement coming into action. The success of this project has seen its replication in countries such as Congo Braz with the PALF project, in the Central African Republic with the RALF project and in Gabon with the AALF project. All of these projects work on the same basis - specializing in wildlife law enforcement. Traffickers know very well that they need a license for their activities but they simply go ahead illegally, for want of larger profits. 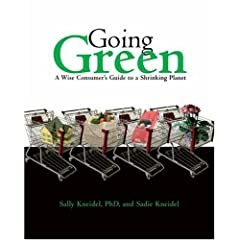 This is done in discriminately, regardless of whether the species are in class A, B or C.
They trade in all kinds of species in cluding totally protected wildlife species. Numerous wildlife species have gone extinct in the African continent some include the Barbary lion that once roamed large areas in North Africa from Morocco to Egypt. Law enforcement it seems is the only viable alternative for the moment against the illegal trade in protected species. While we may hold work shops and seminars to reflect on the mitigation and the halting of the rate of extermination of our wildlife spe cies, the species in earnest are dying out each day. It is estimated that about 6 lions are lost per year in the Waza national park and it is believed that less than 20 lions are left in the park. From the arithmetic, this means that we may be bidding farewell to lions in the next 3 or 4 years having been killed to extinction. Our 100-year old house is cursed, say the neighbors. A previous owner of the house shot and killed his next-door-neighbor from the back porch. Seems his neighbor Martha (who was also his sister) cut through his backyard one-too-many times. It irked him to see her scampering up his hill every morning on her way to town, brazenly ignoring his "Keep Out" requests. So one morning, while arguing with Martha's husband Grady about the trespassing, he yanked out his gun and shot Grady dead. Not sure what year that was, but it was a long time ago. The house sat idle for decades, deteriorating slowly. By the time we bought it last year, it was in desperate straits. We debated whether to rehab it or tear it down. But the broad front porch and hidden closets won us over. The flea problem started after we were well into the renovation. First clue was a gigantic raccoon living in the attic. The holes in the roof had to be closed up, so the raccoon was evicted, its dung piles left behind. Then we realized feral black cats were living in the crawl space. The contractor chased the cats out, closed off their access. A week later, their fleas all migrated into the living area of the house looking for new warm-blooded hosts. The contractor told us no one could go in the house, the fleas were so bad. I was living out of town, so I picked the cheapest exterminator I could find by calling around: Terminix. A "technician" came out and sprayed the crawl space and all the baseboards in the house with a chemical brew of Permethrin and (S)-Methoprene (as they told me later). A week after that, the fleas were back in full force. Terminix came back, did it all again. A few days later, I arrived in town to spend a few nights in the house, sleeping on the floor. 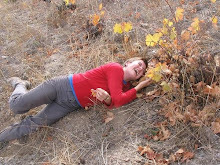 Five minutes after I lay down in my sleeping bag, my throat began to burn. I got up to make sure all the windows were wide open, moved as far away from the baseboards as I could in a room that had been mopped, then went to sleep. The next day I developed a cough, which progressed into a rip-roaring cough that's kept everyone in the house awake every night. It's been 3 weeks since then; the cough has still not gone away. The hacking got bad enough to scare me - started thinking I had pneumonia or TB or lung cancer. Went to the doctor who ruled those out with a chest x-ray, said it could be from the inhalation of chemicals, no way to tell. The "Material Safety Data Sheet" that Terminix sent me when I asked for chemical information says, "Inhalation: remove victim to fresh air. If not breathing give artificial respiration, preferably mouth-to-mouth. Call a physician if effects occur." Effects? Well, whatever. I guess my cough is an "effect." Fleas return; Terminix says "Too bad"
Okay, so a few days later the fleas began showing up again. I called Terminix who said tough luck; our only option was to sign up for the "Annual Plan" (monthly sprays from the technicians). That was easy to turn down. Just out of curiosity, I called an exterminator with a "nice" sounding name, one the contractor recommended: "Home Team Pest Defense." They refused to tell me what chemicals they would use. Said the technicians would divulge the chemical names when they arrived to spray. Coughing, I hung up. After deciding to avoid more toxic spray, our first move was to buy a box of "food grade" diatomaceous earth from Deep Roots Market. 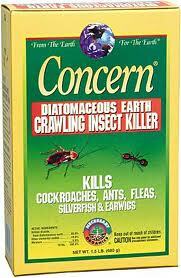 Diatomaceous earth clogs the breathing spiracles of insects, killing them. 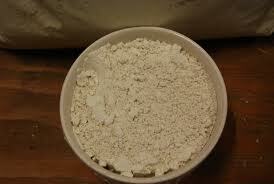 It's a fine silica powder made of the cell walls of diatoms - a type of algae. We sprinkled the d.e. over the floor of the entire house and left it in place for 10 days. No one entered the house during that time, to avoid feeding any of the fleas (which need a blood meal to reproduce). By leaving the d.e. in place for 10 days, we also killed any hatchlings of eggs laid before the adults succumbed. That plan worked well. But not quite well enough. A few days after vacuuming up the diatomaceous earth, fleas once again appeared - in the bathroom, then a few in the room next to the bathroom. Every day, 25 fleas or so were showing up in the bathtub (all killed by pouring shampoo on them). By watching them, we figured out they had to be coming from a hole between the tub and the wall. A passage to the crawl space? Don't know. 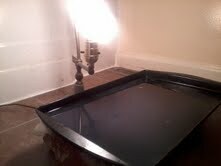 We caulked every crack and hole in the area of the tub, and the flow trickled to around 5 fleas per day. Our daughter and her boyfriend needed to move into the house pronto, so covering the floors with diatomaceous earth was no longer an option. What to do? We searched the internet, made lots of phone calls, came up with a plan. Almost every source recommended daily vacuuming, then sealing the vacuum bags in a plastic bag and throwing them away immediately. My daughter read that 94% of fleas present at any one time are sucked up in a single vacuuming. 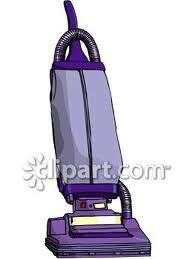 Some said that a vacuum heavy enough to vibrate the floor does better - shaking the fleas and eggs loose. 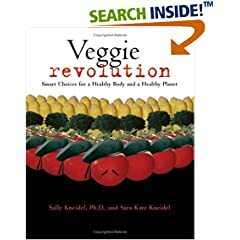 This permaculture forum is one of the most useful sites I found. "A good solution: flea traps, daily vacuuming, DE in places the vacuum cannot reach (and where you aren't going to kick up the dust) plus a daily flea combing for your pets. As time passes and the flea traps and the combing is not turning up any fleas, you can cut it all back to once or twice a week." So we redistributed diatomaceous earth in places the vacuum could not reach. And then the light traps. 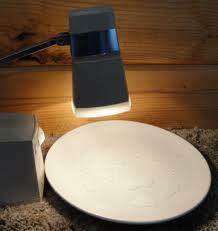 Ken and I had used light traps to fight a flea infestation when our kids were babies, and they worked great. Fleas are attracted to the heat of an incandescent bulb, and when the bulb is suspended over a pan or plate of soapy water, or something sticky like honey, they fall in and they either drown or get stuck. We used soapy water. Worked like a charm. 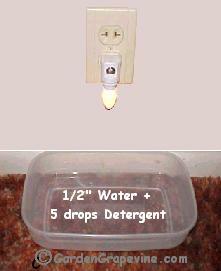 It's recommended to keep the traps going (at least every night) until no fleas have been caught for a week. 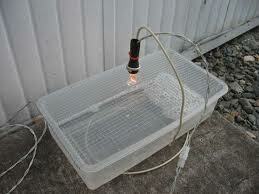 Below, pics of homemade light traps for fleas. The first one is our current trap. Photo courtesy of indestructables.com. 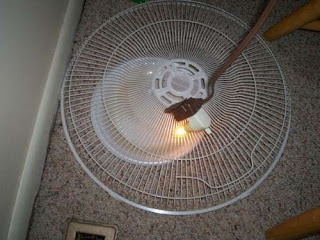 In this pic, part of a fan casing covers the trap to keep kids and pets out, with just a night light on top. The site Beyond Pesticides said if you steam-mop, "the warmth and humidity of the steam may also stimulate remaining flea eggs to hatch a day or two after the cleaning, so some fleas may reappear. The few fleas that hatch after the steam cleaning should be the last of the flea population, and can be caught with a vacuum." 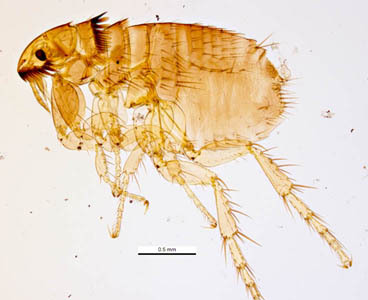 It goes on to say, "If only a few fleas are caught [by the light traps], the infestation is very small and can probably be controlled by the traps alone, and the traps should be left in place until no additional fleas have been caught for a week. If 20 or more fleas are caught in a week, there is probably a more serious infestation, and it is time to find the source." With our original infestation years ago, Ken and I each carried a jar of alcohol and walked across every square yard of the house every day, slowly. And every time a flea jumped on us, we plucked it off and dropped it in the alcohol. This is better than squashing them, which could squirt out live eggs onto the floor. We kept the jars on top the fridge where the kids couldn't reach them. My daughter talked to some friends who made a cayenne bomb and said it killed all their fleas. So Sadie (my daughter) set off such a bomb in our crawl space yesterday.She said she got hookah charcoal from a local hookah store. She lit the charcoal with a lighter, per instructions from the store, then put a spoonful of cayenne pepper on top of it. Closed it up in the crawl space. We'll see if it helps. I was unable to find out anything about this from an internet search. So, although the fleas have been a drag, I don't think the house is cursed! We're about to squash the blood-sucking fleas, I think. Just to keep the vibes good, we're thinking of having some kind of house-blessing ceremony. The fleas will not be invited. If you have tips to share, about fleas or house blessings or exterminators, please post comments.